At the end of March, Trump slapped $50 billion worth of tariffs on Chinese imports. China retaliated with tariffs of its own on about $3 billion worth of U.S. imports. If both countries follow through, on the surface it may seem that China is getting the short end of the stick. Like the Japanese, the Chinese tend to think in the long term with regards to infrastructure and business planning. And back in 2011, the manufacturing of electric vehicles was one of the nascent industries that China began planning for. China’s big cities were all choking on diesel and gas fumes from fossil fuel-powered cars, trucks and buses. China decided a switch to EVs would help reduce that pollution. In order to eventually produce EVs, the Chinese began to identify all the strategic raw materials its manufacturers would need. China already had a monopoly on rare earths. In 2016, it produced more than 80% of all rare earth metals in the world. Those elements are used in many of today’s hottest products and technologies. These include LED bulbs, computers, smartphones, cruise missiles, stealth fighters and wind turbines. Rare earths are also used in EV motors. But China knew it needed another critical element to manufacture high-power-density EV batteries. Chinese firms refine about 77% of the world’s raw cobalt supply into battery-ready chemicals. But China has to import nearly all of the raw cobalt it needs. You see, China has almost no cobalt reserves of its own. But about 65% of global cobalt reserves are located in the Democratic Republic of the Congo (DRC)… which is not the most friendly place to do business. Environmental concerns abound. And much of the DRC’s cobalt is produced using child labor. None of that bothers the Chinese. So over the last few years, they have quietly gone about locking down as much of the world’s raw cobalt production as possible. In March, Glencore PLC (OTC: GLCNF), the world’s largest cobalt producer, agreed to sell a third of its output to Chinese metal recycling company GEM. GEM processes raw cobalt into battery-grade cobalt chemicals. It then sells those to battery manufacturers. Up until the Glencore deal, GEM got most of its cobalt feedstock by recycling lithium-ion batteries. This year, GEM will receive 13,800 metric tons of cobalt. That will increase to 18,000 metric tons in 2019 and 21,000 metric tons the following year. It would seem that Western EV battery and vehicle manufacturers have been caught with their pants down. Because now they have to deal with China. How is it that the Chinese are ahead of the West? It’s simple: They understand EV raw material requirements. More importantly, they started to lock up strategic materials well ahead of Western companies. It is those same Western companies that are scrambling to lock up sources of raw cobalt. 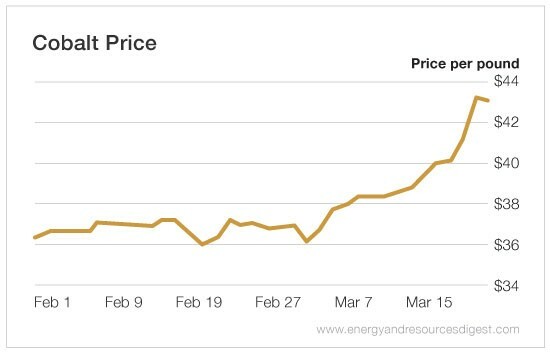 Prices are up more than 18% over the last month alone. In the past 12 months, prices have climbed about 90%. If China really wants to play hardball, it could begin restricting exports of processed cobalt. Much of that goes to Japanese and South Korean technology companies that use lithium-ion batteries in laptops and smartphones. So what is rapidly ramping EV demand going to do to cobalt prices? Demand could easily jump from 2017’s 9,000-metric-ton market to 107,000 metric tons by 2026. Prices could double or even triple from here. That would move some planned projects rapidly forward into production. Investors who are concerned about the volatility in today’s markets might want to consider a few up-and-coming cobalt producers. Their share prices are headed in only one direction: up.